Time In A Bottle” had a soothing sound to it. If I could have done so, I would have put in a bottle, the time that I was away from my daughter. She was six months old when I left on my airplane ride, 9,000 miles in length. A year later, when I returned home, my daughter didn’t recognize me. Yes! I would love to have put that time of her life in a bottle. I can still visualize the surroundings of the base where I was assigned (Udorn Royal Thai Air Base, Udorn, Thailand). I can still remember the many times that I listened to this beautiful song. Jim Croce’s untimely death left many songs unwritten, many words unsung, and a music world and Jim Croce’s fans deeply saddened at his loss. I hope that you will enjoy “Time In A Bottle,” which was brought to my mind a few days ago by another blogger; I am very thankful for our chat conversation. 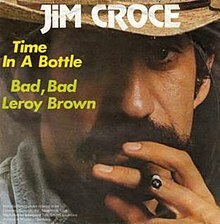 Please take time to make yourself familiar with the words of the song, and the information that I have been able to find on the life of Jim Croce.